Availability: --SOLD OUT-- All XM551U floor models are now sold. Our popular NAB Floor Model Sale is back again this year. This is your chance to save money on some of our most popular monitors. This is new equipment that will be used at the FSI booth as well as many partner booths across the show floor the week of NAB (April 8th - April 11th). This gear is new when it is sent to NAB. It will of course be used when it gets back, but FSI will clean and inspect every unit before sending it on to the new owner. Units come with a full 2 year warranty, just like new equipment. You will be charged when you order and we cannot hold or otherwise reserve a unit without full payment. Items are strictly available on a first come, first served basis and we typically sell out of most Floor Models well before NAB actually starts. NAB runs from April 8th through April 11th. To allow time for the units to return to our office and to be properly cleaned and inspected before being shipped to you we estimate a ship out date (from Atlanta) between April 22nd and April 26th. While we will do our best to expedite all Floor Model shipments please DO NOT order a Floor Model if you need a guaranteed ship out date earlier than April 26th. As we did last year we will not limit the number of Floor Models any one company or person can order, but all multi-piece Floor Model orders are final. *Offer is not available to customers in Europe. 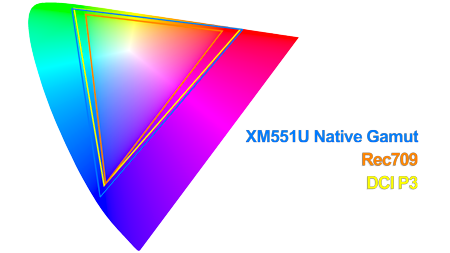 The 55” Flanders Scientific XM551U is a professional large format OLED reference monitor designed for color critical monitoring of 4K, UHD, and HD signals. It is equipped with 12G/6G/3G/HD-SDI inputs and outputs ensuring compatibility with virtually any SDI interface. Visit www.FlandersScientific.com for more information on XM651U features. XM Lift Case - 55"